The recent much-publicized report World at Risk predicts that we are soon to experience a biological or nuclear weapons attack. … we are at least equally likely, if not more likely, to soon experience large-scale morbidity through epidemics of emergent pathogens. As was illustrated by the severe acute respiratory syndrome–associated coronavirus, when a ubiquitous nuisance pathogen suddenly becomes more virulent, its reign of destruction needs little help from rogue nations or terrorist cells. Humankind is quite efficient in spreading such pathogens around. That paragraph was written last December and published in early April, a couple of weeks before the new H1N1 influenza cases were detected in San Diego, making the author look prescient. Except, of course, the article has nothing to do with influenza. This is from an editorial1 in the Journal of Infectious Disease, and refers to a series of papers2 showing that adenovirus strain 14 has suddenly exploded throughout Oregon and Texas in the past year or two, hospitalizing dozens and causing at least 17 deaths. Adenovirus infections are very common in humans, and usually don’t cause much in the way of disease; they’re one of the “common cold” cluster of agents (see an earlier post on adenoviruses here, and other posts here). But there are over 50 different human adenoviruses, and some are both more severe, and less common, than others. 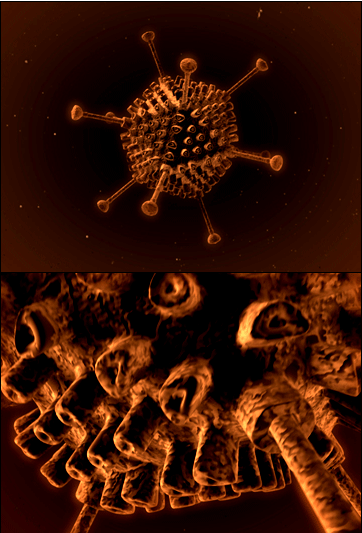 Adenovirus Type 14 (Ad14) was actually one of the sporadic, fairly moderate, strains, until 2005 when a new variant of the virus (poetically called “Ad14a”) abruptly started causing epidemics. It’s this new variant that’s continued to cause these outbreaks. Most Ad14a infections are probably minor. Probably; we don’t really know, because “ Ad surveillance is generally passive. Additionally, relatively few laboratories look for Ad, and even fewer can distinguish Ad14 from other Ad types. ” 1 So we don’t know how many Ad14a infections there actually are. This is the same “missing denominator” problem I alluded to with the Mexican cases of the new H1N1 — when we find that 18% of patients with Ad14a infection die, does that mean it’s a very serious disease, or does it mean doctors only look for Ad14a in seriously ill patients? In all likelihood, there are a vast number of Ad14a infections that are missed (“ With its propensity for rapid transmission, it seems likely that Ad14a is now circulating throughout the United States and may have been introduced from another country “). Still, the virus clearly can cause serious problems. It’s just another warning that we’re constantly under siege by pathogens. We probably should understand better what’s attacking us.